I was really interested in the Connected Communities programme of research, because the whole idea of helping people to connect with one another is very important to me. I have done quite a lot of research with children and young people, and I wanted to write a bid for a project that would help them to tell their stories, especially stories that might not be heard otherwise. I joined up with Bernie, Cath, Paul and Helen, and we brought lots of ideas together to make a project that I think is really exciting, challenging, interesting, and valuable. After we had written the bid – which took AGES – the Arts and Humanities Research Council agreed to fund it. When I heard that we had been successful I was so excited I jumped into a swimming pool with all my clothes on (I was on holiday at the time!). 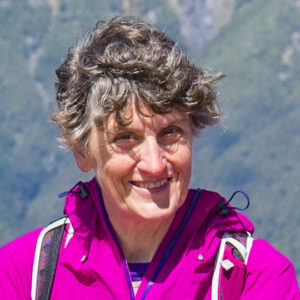 I am the Principal Investigator on the project, which means I am involved in all aspects of it, and responsible for getting it done – and hopefully done well! I go to all the meetings with the young researchers, and help with the interviews and creation of stories. I help with the analysis of all the information we have collected and think about how we can get this information across to as many people as possible. Eventually we will be connecting with members of the public through the phygitals we create, connecting with children and young people in schools through stories, and helping social workers and health professionals to understand better how to work with people in need. I started off with a degree in English Literature. Later I trained as a teacher in Further Education and then did a PhD in Literacy Education. I taught English Language, English Literature and Linguistics for many years in FE colleges and universities. At the same time, I did a lot of research into the ways people use reading and writing in their lives. I have always been particularly interested in people ‘on the edges’ who might use reading and writing in ways that are a bit different or unconventional. I worked with people who are homeless, FE students, children and teenagers. Then I starting working at UCLan as a lecturer in Education, which brought together all my teaching and research experience. Now I am Course Leader for the Masters and Doctorate in Professional Practice in Education, and I also supervise PhD students. Stories to Connect is particularly exciting for me as it unites my research interests in narrative, literacies, literature and education. I am especially enjoying working with our young researchers, who have helped me to understand a lot about different ways of doing research. It is great to be working with such a lovely team of academics, volunteers and young people, and I love working all together to produce something we are all happy with. I like creating stories in different ways – using fiction as well as ‘facts’ and creating narratives that the young people think resonate with their lives. It will be fascinating to see how the stories can be told in different ways through phygital design, and how the stories might be transformed as cartoons, films, monologues, and any other ways we come up with. I’m very keen on chocolate, and good coffee. I love walking in the hills and being outside, especially with my family and friends. And I love a good story …. I have worked with UCan young researchers for four years, to start with Bernie was involved in this work too. The young researchers asked me to find a way of them interviewing other children and young people to collect their stories. Bernie told Candice to get in touch with us and we all started to exchange ideas. I am a co-applicant on the study and have responsibility for the participatory approach, evaluation and linking our research findings to social work and political theory. I work really closely with the young researchers, Candice and Gail to plan and put into action the gathering of stories. I also work with Gail to evaluate the research process. I am a Reader in Children’s Citizenship. This means I read and write about children’s rights and responsibilities, their participation and the way they are treated. I explore the links between children’s everyday lives and local, national and international political dynamics. I work with and for children who are discriminated against, usually doing action research. Together we use research, training and campaigning to identify solutions and to try to bring about change in local services, communities and international policy. I have a worked as a researcher with and for children since 1997. For the first ten years, this was mostly with children’s charities or short contracts for locl and national government. Now a lot of my work is with European partners trying to build solutions and digital resources that can be shared across national borders. I always love working with young researchers. In this project, for the first time, Gail is doing more of the work facilitating the day to day running of the participation activities. So this is also giving me a real chance to step back and reflect on how and why we do what we do, where it is different from what others do and what it means to do participatory research well. I’m enjoying reflecting on the political theories that might be relevant to our findings, and learning about storytelling. I am excited to see what our collaboration with authors and designers will lead too. I really love cycling. Just like Bernie, I love the sense of freedom and happiness and I prefer going up hill to downhill. I also love speaking French, and when I speak French I often feel more at ease than when I speak English. Prof Paul Coulton is the Chair of Speculative and Game Design within Lancaster University’s open and exploratory, design-led research lab, Imagination Lancaster. 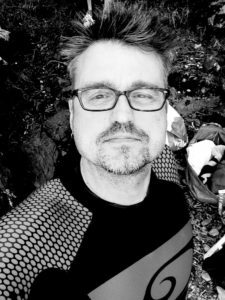 His research practice is embodied primarily as ‘research through design’ to develop design theories from the speculative design of novel, hybrid, physical/digital interactive future focused experiences and artefacts. The most recent examples relate to the use of Design Fiction as a way of exploring futures of emerging technologies. 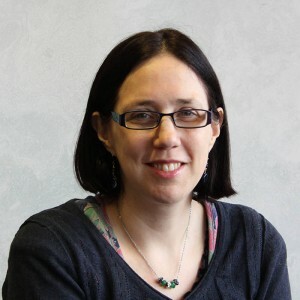 Dr Helen Day is a Senior Lecturer in English Literature and Creative Writing at the University of Central Lancashire. 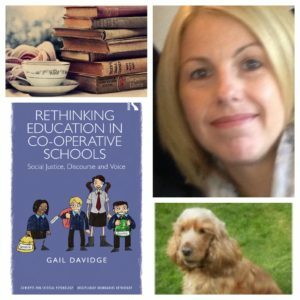 She specialises in writing for children and young adults and narrative theory and became involved in the project through her interest in the narratives of young people. She really enjoys reading the interviews of the young people involved in this project as they are conducted by other young people. Her role so far has involved editing these interviews and drawing out themes that show what it’s like to be a young person in twenty-first century Britain. She has also brought in the two published authors, Melvin Burgess and Adele Geras. Her most recent publications are about unreliable narration in fiction for children and young adults. 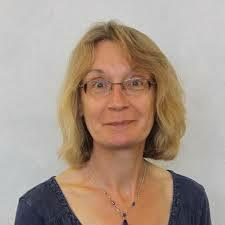 She is interested in what knowledge and experience children and young adults bring to their reading of such novels. Helen has two rescue cats called Messy and Tidy. She loves Buffy the Vampire Slayer and Lego. She reads extensively across adult, YA and children’s fiction. I have worked with Candice Satchwell on other bids and projects and when she invited me to join a team she was bringing together to develop a bid I was delighted to say ‘yes’. I am a co-applicant on the study and my role lies mainly with my interest in Narrative Inquiry and the stories people tell about their lives. I have been involved in facilitating some of the workshops. I also have a role in data analysis, particularly in terms of the analysis of the stories generated as part of the study. I am a children’s nurse although I now work in research. My PhD was an observational study of preterm babies within a neonatal intensive care unit and the focus was on pain assessment with the aim of trying to improve the assessment of their pain. My current research is fairly eclectic although I have always maintained an interest in assessing and managing children’s pain, especially for children who cannot self-report. Other areas of research include work relating to children’s agency, participation and decision-making. Most of my time as a clinical nurse I worked in hospital settings such as children’s intensive care or neonatal intensive care although most of my research now focuses on undertaking research within children’s homes. The story element is one of the things that drew me to this project as well as the opportunity to develop an understanding about the Internet of Things and to see how working alongside young co-researchers, designers and authors could result in a really interesting and creative journey and some innovative outputs. One of the best aspects of the project is working with the young people – they are wonderful to work with. I really love cycling, not least because it is a really environmentally friendly form of transport. However, I also love the sense of freedom and happiness I experience when I am cycling. I prefer going up hill to downhill (odd but true). 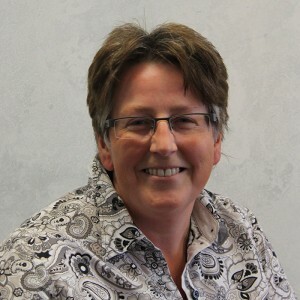 Hi I’m Gail and I came to work at UCLan on the Stories2Connect project in May 2015 straight after completing my PhD research which was all about trying to make schools fairer places for everyone. Before that, almost all of my previous jobs have involved thinking about education and well – being and working with children and young people of all ages in a variety of settings. I was really pleased to accept a position as a researcher on this project as it combines lots of my interests and favorite things – stories, being creative and working with children and young people – all in one go! It’s been a really interesting journey on the project so far, I’ve loved listening to our young researchers interview other children and young people about their lives and I can’t wait to see how these stories develop into phygital objects and other stories for people to connect with over the next year or two. As well as working on the project four days a week, I’m also a mum to two teenage girls and am in the process of training to be a Childline counsellor. If I ever get any free time I like to spend it with my family and friends, visiting quirky cafes and going on long walks in the countryside. My idea of bliss is to be curled up with my dog in an old battered armchair reading a good book, drinking good strong coffee and eating home-made cake in between chapters.